Cicindela pulchra pulchra (beautiful tiger beetle) - Fall River Co., South Dakota. Five years ago this month, I got my first glimpse of North America’s most beautiful tiger – Cicindela pulchra. 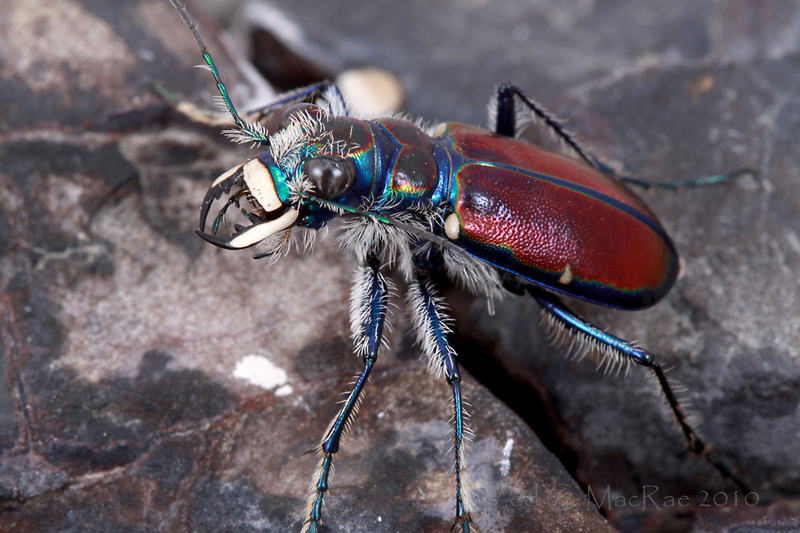 This is not just my opinion – its name, given to it by Father-of-North-American-entomology Thomas Say, literally translates to “beautiful tiger beetle.” Like Amblycheila cylindriformis, it was a species that I longed to see in the field ever since receiving a single specimen from tiger beetle guru Ron Huber. That specimen came from the Gypsum Hills of Barber Co. in south-central Kansas – a known “hot spot” for the species. For years I stared at that spectacular specimen as it sat in my cabinet, and in September 2004 Chris Brown and I finally made our first attempt to see it in the field for ourselves. Unfortunately, we arrived ahead of the fall rains that seem to trigger emergence of this species, and C. pulchra would not be among the few species that we saw on that trip. 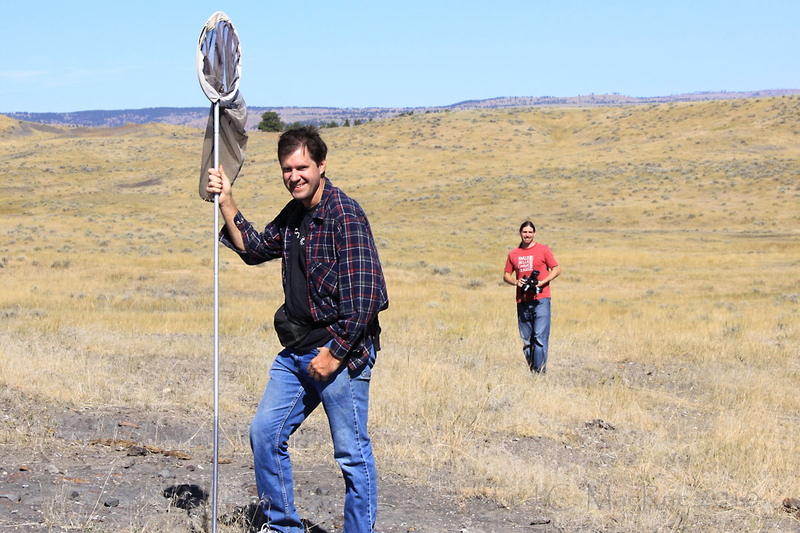 I don’t handle defeat very well, so the very next fall I resolved to try again – this time waiting until early October and also enlisting the assistance of local entomologist “Beetle Bill” Smith for access to better sites than what are available along the roadsides. That trip was a tremendous success and was detailed in one of my Nature Notes articles (MacRae 2006), but Chris, unfortunately, was unable to join me on that second attempt. He couldn’t join me last year, either, for my search of the species in the nearby Cimarron Gypsum Hills of northwestern Oklahoma. Good thing, however, as a turn of the weather left me just cold and wet (although I do remain convinced that the species will eventually be found on those red clay slopes that have so far produced such prizes as Cylindera celeripes, Dromochorus pruinina, and Amblycheila cylindriformis). Matt Brust (L) and Chris Brown (R). Matt discovered this site for Cicindela pulchra in 2009. Fortunately, while I was getting skunked in Oklahoma, Matt Brust was discovering new populations of the species further north in the southwestern corner of South Dakota. These discoveries were prompted by the initial discovery of the species on Pierre Shale exposures at a single site near the Black Hills (Larsen and Willis 2008). The soft, dark gray soils of the Pierre Shales are in distinct contrast to red clay exposures with which the species has been typically associated further south, and by scouting a broader area for similar exposures Matt was able to find the species at six new sites during late summer 2009 (Brust 2010). 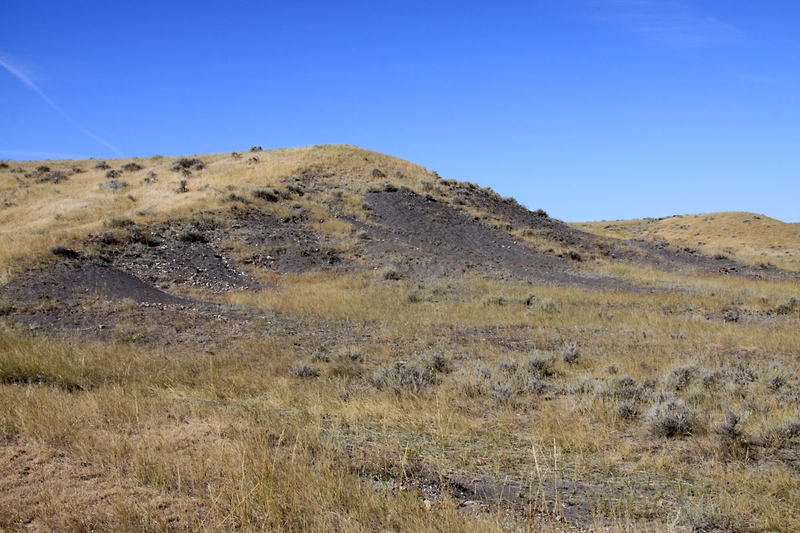 He found them associated not only with the Pierre Shale but also the Mowry Shale formation (and suspects they may eventually be found on Belle Fourche Shale formations as well). When I learned of these discoveries, I decided I just had to see them for myself. I had enjoyed my Fall 2008 trip to northwestern Nebraska and southwestern South Dakota, and the thought of seeing these beetles while spending time in the field with Matt once again seemed the perfect basis for another trip to the area. It didn’t take much convincing for Chris to agree, thus, C. pulchra became goal #1 of the 2010 Fall Tiger Beetle Trip™. Habitat for Cicindela pulchra in Fall River Co., South Dakota. Adults and larval burrows are found in sparsely vegetated gray shale slopes and open flats beneath. As we drove to the site that Matt had selected for us to explore, I felt nothing but optimism. The skies were clear and the temperature was already nearing 70°F. Matt, however, was hedging his bets – “I hope they’re still out, I’ve never seen them this late!” Still, I wasn’t worried. 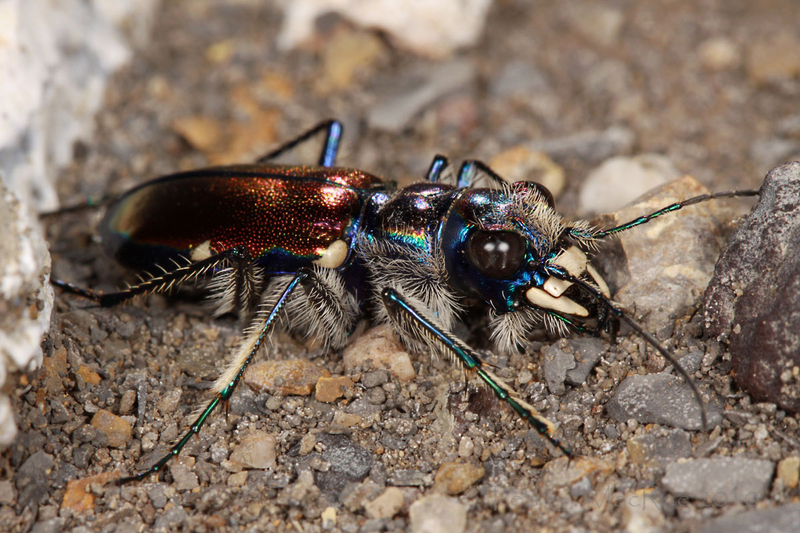 We were two weeks earlier in the season than the 2005 Kansas trip, and the weather was simply spectacular – it just had to be a good tiger beetle day! My optimism was justified, as within minutes of arriving at the site we saw the first individual. I collected this one alive as a backup for photographs in the studio should that be the last one we saw, but no such contingencies were necessary – we began seeing individual after individual as we trolled across the barren gray slopes. Adult male Cicindela pulchra taking in the morning sun. These beetles are simply a marvel to see in the field. 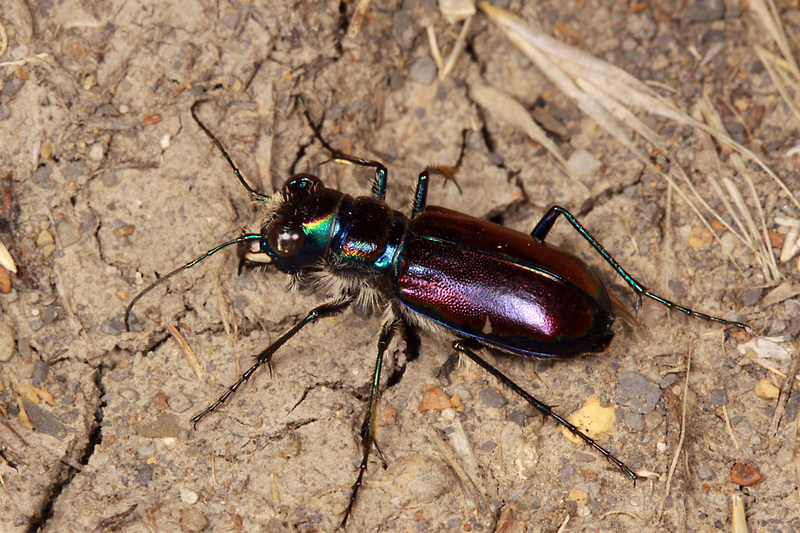 Brilliant dark red with metallic green, blue, and purple borders on the head, thorax, and elytra, this relatively large tiger beetle (certainly among the largest in the genus) can be confused with no other tiger beetle in North America. Unlike adults of most other species, which exhibit color patterns resembling the texture and hue of the soil substrate on which they occur, C. pulchra adults are obvious and non-cryptic. It apparently mimics the large, similarly colored velvet ants of the genus Dasymutilla with which they are sympatric – even exhibiting similar behavior when alarmed such as stridulating (creating vibrations by scraping body parts across one another) and giving off defense chemicals (Pearson 1988). Adults are powerful fliers that can fly long distances when alarmed (Spomer et al. 2008), but in the still relatively cool morning air Chris and I had relatively (emphasis on relatively!) little trouble getting close enough to attempt those coveted field photographs. This, however, was a double-edged sword – the same cool temperatures that allowed us to get close enough for photographs also caused to the beetles to assume the most non-photogenic poses as they sprawled torpidly on the ground, sometimes hugging it closely in an attempt to conserve heat until incident radiation from the sun warmed them sufficiently to go about the day’s activities. Once this did happen, we found getting close enough for photographs nearly impossible. In the 2+ hours that we chased after them, we took many shots but failed to get that “perfect” shot of a brilliant beetle standing tall and alert. Adult male Cicindela pulchra hugs the ground during the cool morning hours. Cicindela pulchra is a “spring/fall” species – i.e., sexually immature adults emerge during fall to feed, then return to their burrows to overwinter before emerging again in spring to mate and lay eggs. Pearson et al. (2006) state the fall period lasts from July to September; however, as I observed in Kansas in 2005 adults can remain active well into October as long as suitable weather prevails. Larvae hatch shortly after eggs are laid in the spring, but larval burrows can be seen during the entire season since they require 2-3 to complete development. It was actually the presence of the large larval burrows (see photo below) that alerted Matt to the occurrence of the species at this site. 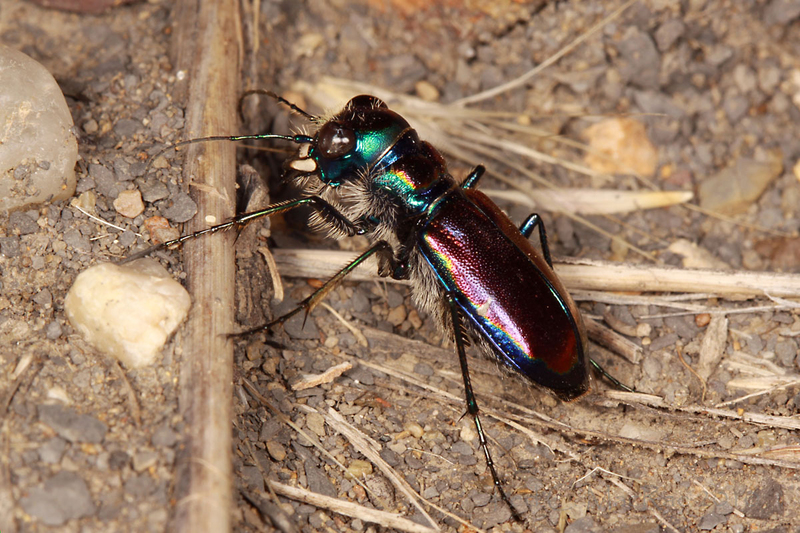 Several other tiger beetle species are also found here, e.g. C. purpurea (cow path tiger beetle) and C. tranquebarica (oblique-lined tiger beetle); however, these species – and hence their larval burrows – are considerably smaller than C. pulchra. The only other species of Cicindela in North America that matches C. pulchra in size is C. obsoleta (large grassland tiger beetle), a southwestern species that is not known to range as far north as Nebraska and South Dakota, and the slightly smaller C. formosa (big sand tiger beetle) larval burrow has a distinctive “pitfall trap” with the burrow opening situated horizontally above it (it is also restricted to dry sand rather than clay habitats). We saw several C. pulchra larval burrows during our visit but no active larvae, and none of my attempts to “fish” them out of their relatively shallow burrows met with success. I could have tried digging them out, but that is a time-intensive activity, and I decided instead to bring a few live adults back in a terrarium of native soil and see if I could rear the species from egg. Despite the presence of at least two other tiger beetle species at the site, this can only be that of a 3rd-instar Cicindela pulchra due to its large size. I had tried persistently during the last hour we were there to get a good field photograph of an active adult beetle standing tall and alert, but the following is the closest I was able to achieve. Leaving the site without that “perfect” shot was difficult – as Matt put it, we had “pulchra fever”! Still, there were other tiger beetles – e.g. C. nebraskana (prairie long-lipped tiger beetle) and C. decemnotata (badlands tiger beetle) – that we wanted to find in the limited time we had to explore the region, so I prepared a terrarium for the live adults I was bringing back with me and chalked up our first big success of the trip as we headed towards the shortgrass prairie sitting atop the nearby Nebraska Pine Ridge. I chased this adult female for some time trying to get a closer photograph, but warming temperatures made this impossible. In addition to attempting to rear the species, bringing live adults back with me also gave me more opportunity to photograph them. In addition to the native crumbly shale soil that I used to fill the terrarium, I placed in it one of the nicely colored, presumably volcanic, rocks that littered the slopes on which the beetles occurred. The dark color of the rock makes a nice backdrop to really show off the extraordinary colors of this species – especially the bright white labrum and mandibles of the particularly impressive male in the following photograph. The beetles are all now sound asleep for the winter in a 10°C incubator. Hopefully, when I move the terrarium back into warm temperatures next spring they will re-emerge, mate, and lay eggs (hmm, photographs of a mating pair would be really nice!). The all-white labrum and mandibles of this male Cicindela pulchra are displayed nicely in this terrarium photograph. Insects: Canon 50D w/ 100mm macro lens (ISO 100, 1/250 sec, f/16), Canon MT-24EX flash w/ Sto-Fen + GFPuffer diffusers. Habitat: Canon 50D w/ 17-85mm wide-angle lens (ISO 100, 1/160 sec, f/11), natural light. Matt and Chris: Canon 50D w/ 17-85mm wide-angle lens (ISO 100, 1/250 sec, f/11), natural light. All photos w/ typical post-processing (levels, minor cropping, unsharp mask). Brust, M. L. 2010. New distribution records for Cicindela pulchra pulchra Say in South Dakota and notes on habitat use and natural history. Cicindela 42:1–10. Larsen, K. J. and H. L. Willis. 2008. Range extension into South Dakota for Cicindela pulchra (Coleoptera: Carabidae). The Coleopterists Bulletin 62(4):480. Pearson, D. L. 1988. Biology of tiger beetles. Annual Review of Entomology 33:123–147. Spomer, S. M., M. L. Brust, D. C. Backlund and S. Weins. 2008. Tiger Beetles of South Dakota & Nebraska.University of Nebraska, Department of Entomology, Lincoln, 60 pp. This entry was posted in Cicindelidae, Coleoptera and tagged beetles, entomologists, entomology, Great Plains, insects, nature, North America's most..., science, South Dakota, tiger beetles. Bookmark the permalink. Very nice blog and photos Ted-as always! Thank you, Art – I appreciate the FB link you put up! So, when you photograph in a terrarium, do you shoot through the glass walls or actually get the camera in there with the subject? “Terrarium” in this case is a “Critter Carrier” filled to within about an inch of the rim with native soil. I want the soil as deep as possible so that any larvae I get will have enough vertical depth for their burrows. The adults run around on the surface of the soil and are confined by the the lid. For photography I take the cover off and shoot them directly – only rarely do they try to fly away while the cover is removed. A very spectacular species*. Looking forward to your Spring photos. * If there are shades of ‘spectacular’. You know, ranging from the slightly to extremely. hi ted – i had to come over for a quick glimpse of this beauty. buried with work these days, but can spare a second for some of your tiger beetles! pulchra is indeed beautiful and i can’t wait to read about them. looking forward to catching up on your posts this weekend. Hi Amber – hope you enjoy the post. I will say that the photos don’t come close to conveying how spectacularly beautiful they were in the field. Beautiful, Ted! I especially like the last one. Thanks, Alex. The last one is my favorite as well, but I’m using these guys to try out some different lighting techniques and see if I can get some better ones. The field shots are great, “perfect” pose or not. I’m curious to know: what is the diameter of that larval burrow? Larval burrow diameter was 7-8 mm. 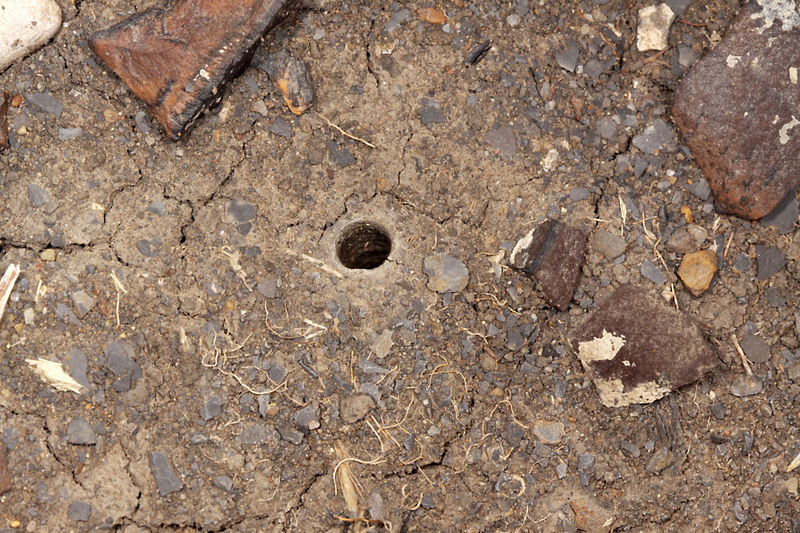 That’s about as big a tiger beetle burrow you’ll see unless you run into Amblycheila. No – life does not get better than that!